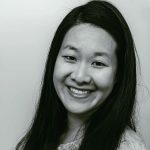 Published Nov 26, 2017 By Julia 169 CommentsThis post may contain affiliate links. 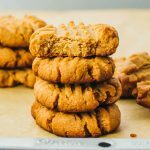 These low carb, keto friendly butter cookies are eggless and made with almond flour and butter. Perfect for the holidays like Christmas. 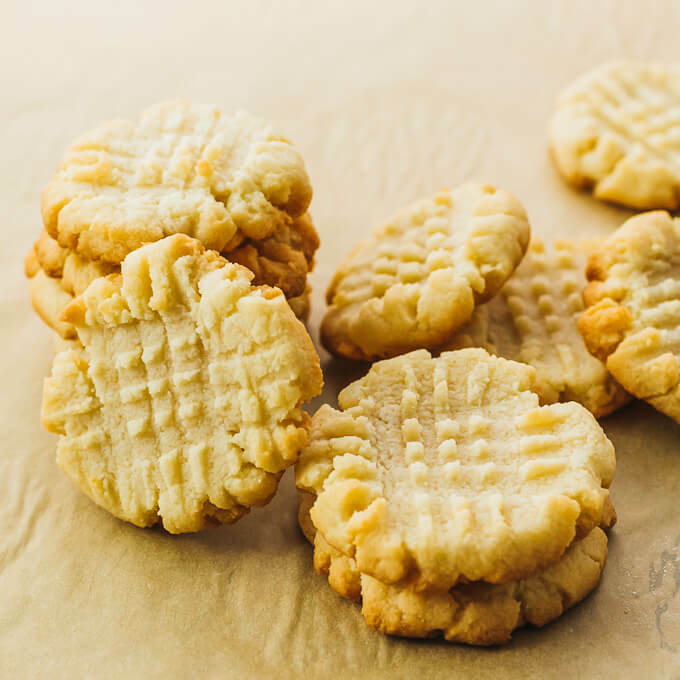 These butter cookies are very low in carbs and make for a healthy treat during the holidays. 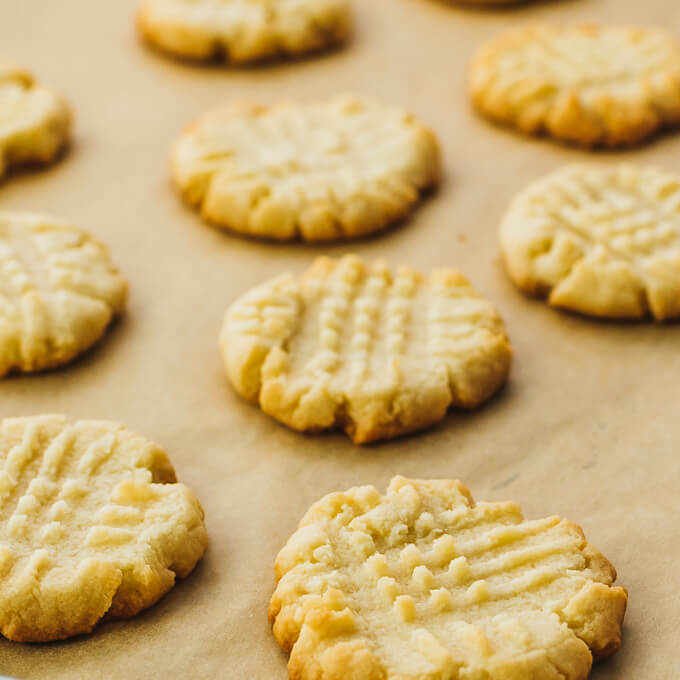 They are not too sweet, with a texture that reminds me of Danish butter cookies or shortbread biscuits. These are quite possibly my simplest-ever homemade cookies. 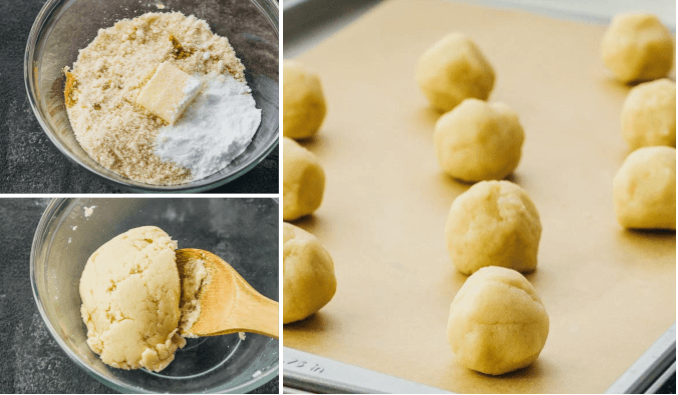 You’ll only need four ingredients to make these simple cookies — almond flour, butter, low carb sweetener (erythritol), and vanilla extract. That’s right, no eggs needed, as room temperature butter binds everything together. You don’t need a hand mixer or any equipment at all; a mixing bowl and a spoon will do. It takes 5 to 10 minutes to whip everything together, and another 10 minutes to bake. These butter cookies took a bit of experimenting to get right. I started with my shortbread butter bars recipe and replaced wheat flour with almond flour, white sugar with erythritol (more on that later), and omitted the egg. The resulting dough was way too buttery and sticky to handle. My next iteration used significantly less butter, just enough to form a cohesive cookie dough. Eggs aren’t necessary in this recipe — the softened butter binds all of the ingredients together nicely. Note that I used softened butter at room temperature, not melted liquid butter. 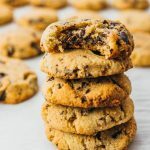 I use erythritol as a low carb sweetener for all of my keto dessert recipes, like chocolate chip cookies and peanut butter cookies. Erythritol doesn’t impact blood sugar or insulin, as our bodies actually cannot digest it. I buy the granulated form of erythritol online, and use my Nutribullet to pulverize it into powdered form, which is easily mixed into dough. If you prefer, you can substitute erythritol with another powdered sweetener; note that erythritol is about 70% as sweet as white sugar. These butter cookies will keep their shape during baking and will not spread, so take care to form them to your desired shape before baking. I used a fork to indent a standard criss-cross pattern onto the cookies, but other ideas include making a thumb print and fill with jam, or sprinkling with sweetened cinnamon like snickerdoodles. These cookies are not too sweet, so they’re a blank canvas for adding other flavors, toppings, and decorations. Simple butter cookies perfect for the holidays. Keto and low carb friendly. Prepare a baking sheet lined with parchment paper or a nonstick baking mat. In a mixing bowl, combine all ingredients, thoroughly stirring until resembling a dough. As you stir, initially it will look crumbly and then it will form into a cohesive dough. Use the dough to form 1-inch balls, placing them on the baking sheet. There should be about 12 balls, separated from each other by about 2 inches. 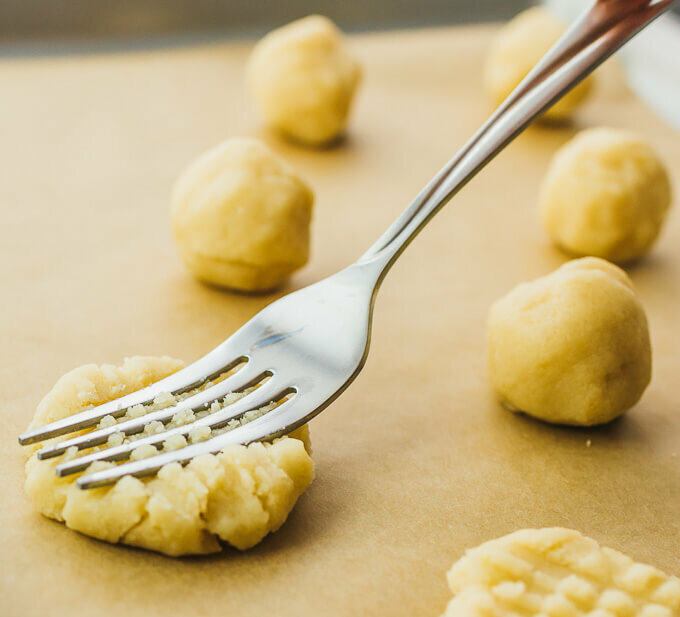 Flatten each dough ball using a fork, then rotate 90 degrees and flatten again, forming a criss-cross pattern. Or form into a different desired shape and pattern. Bake at 350 F until the cookies are golden around the edges, 8 to 10 minutes depending on the thickness of the cookies. The cookies will be very soft when they come out of the oven. Let cool completely before removing them from the baking sheet. 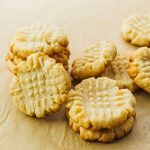 This recipe yields 0.5 g net carbs per serving (1 cookie). Nutrition information does not include erythritol because it cannot be digested by the body. I have been making these once a week, they are SO GOOD. I have been cutting the erythratol down to a bit less than a quarter cup. Last night, I made a batch and there was a lemon half sitting on the counter so I squeezed a little juice into the batter. OH MY! They are absolutely delicious this way. Thank you so much for this recipe. I want to cry!! Tears of joy that is. These cookies are just what I needed for a little dose of goodness as my womanly cravings have set in. I did half with vanilla extract and the other half with lemon extract and I am in love!! Holy crap — I made these with 3 tbsp of Lakanto’s Golden Monkfruit Sweetener (tastes/smells like brown sugar) and they came out amazing. Better than most other butter cookies I’ve had. Even 3 tbsp was a bit much, so next time I’ll try with 2 tbsp. I want more butter flavor than sweetness if ya know what I mean… 🙂 Thanks for the recipe! does the erythritol leave a minty taste to everything you use it in? I have seen several remarks of it leaving a minty taste. That only happens if you use too much in proportion to other ingredients. If you get that cooling effect, dial down the amount you use next time. 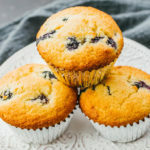 Could i make these with coconut flour? No, coconut flour is not a 1:1 substitution for almond flour. I just made these cookies and they turned really good for my 1st go around. Definitely a keeper. Helps with my craving for cookies! 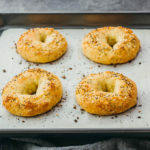 can i use a cookie press for this recipe? Does the erythritol have any taste at all? I don’t like the taste of stevia and other products. I was thinking of not even adding the erythritol. Is that possible? I don’t think they will taste good without any kind of sweetener. Personally, I don’t find there’s any aftertaste with erythritol, assuming you don’t overdo it and add way too much. I made these tonight and found their flavor and consistency OUTSTANDING!!! Don’t know what I did wrong but my cookies came out crumbly and with a bitter taste. I used almond meal flour, swerve, butter and vanilla. Any thoughts? I think the problem is Swerve. Did you perform the conversion? This recipe uses erythritol, which is about 70% as sweet as sugar. Swerve measures the same as sugar, so you would need to make a conversion to keep the sweetness level the same. Also, this recipe is assuming the sweetener is powdered, so you would need Swerve Confectioners and not their granulated version. For best results, I recommend using erythritol to maintain the ratio of dry to wet ingredients. Swerve is an erythritol blend and it’s not pure erythritol. The recipe lists the amount for pure erythritol. Swerve measures the same as sugar, and pure erythritol is about 70% as sweet. That’s why a conversion is needed. 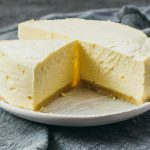 What is the conversion from erythritol to Swerve for this recipe? The recipe calls for 1/4 cup (4 tbsp) of erythritol, which is less sweet than sugar. Since Swerve is a 1:1 sub for sugar, just use 3 tbsp instead. Did you powder the Monkfruit? I would like to make it with Lankanto Monkfruit. ALON this question is for you. 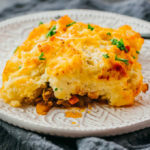 I have Gestational Diabetes so I was so happy to try this recipe! Of all the sweets I have tried to make with stevia this had the least funky fake sugar flavor. I felt like I was eating a normal cookie!! Where did you find the sweetener? What sweetener did you use? Thank you so much for this AMAZING recipe. This one is a HOME RUN!!! They are chewy and delicious right out of the oven but they are just as good at room temperature. I sprinkled the tops of mine with a little granular Xylitol. They taste better than some “real” cookies we bought the other day. Very yummy, even my husband loved them. Added a little lemon zest because I love all things lemon. But they did spread some while baking. Next time I will try to keep them thicker when I press them with a fork. Worth making again! I agree, they had a cooking effect I didn’t quite like. I will try with my stevia next time and almond extract. I made them and they were very yummy! 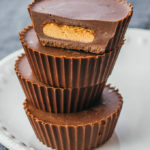 And I also since there is no egg in this recipe I didn’t bake them the next time I left them in balls popped them in the fridge and made fat bombs out of them! very very yummy! What a fabulous idea, Becky 🙂 Glad you enjoyed them!